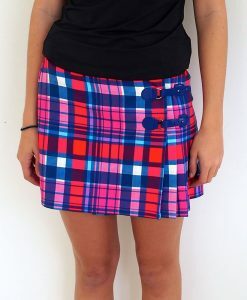 Of all items of Women’s Golf Apparel women’s golf pants are perhaps the hardest to get just right. True, you do need a comfort fit for great golf, but so many golf pants are shapeless, dull and boring. Or you might think you’ve found the ‘perfect’ pair only for them to lose their shape after just one round – leaving you with a saggy derriere and a desperate need for a belt. Fashion pants sometimes work, but you need pockets in the right places, and too tight pants are a no-no for the dress regulations. Ditto cargo pants, jean-like pants and trousers with studs. There’s plenty that you just can’t wear, or don’t want to wear. So what’s available that looks good, feels good and won’t get you into trouble with the dress code fanatics? The first rule of buying golf pants, obviously, is to get a pair that suits your shape. The second rule is to check the label to see what fabric the pants are made of. You need a little bit of stretch to swing freely, but too much and the pants will start to look saggy and shapeless even during the round. So you need to check the ‘stretch’ (sometimes referred as elastane or the proprietary name of Spandex). We’d say a minimum of around 3-5% and a maximum of about 12-14% is about right. Pohli’s women’ golf pants are made of easy care Polyester with 9 – 11% elastane content. The other thing to look for is the feel of the fabric. Generally with a heavier the fabric you need a stretch content towards the higher end (11-12%). Conversely with lighter fabrics steer away from too much elastane – this combination will show just a few too many lumps and bumps and/or make you look like you’re in gym wear. Neither is a good look on the golf course. Pohli’s women’s golf pants are made of easy care Polyester with 9 – 11% elastane. We’ve gone for a classic, tailored shape with a modern, narrow leg fit. If you are muscular or between sizes we’d recommend going up a size. As with all our pieces we’ve included plenty of pockets for your markers, tees and pitchforks! Check out our main image which shows our new winter pants at ‘toile’ stage and the finished product below! Women’s Golf Apparel – from Concept to Perfection! This entry was posted in Women's Golf, Women's Golf Apparel. Bookmark the permalink.